Nine years ago, they started in erosion control, building silt fences and water quality ponds for new construction. “That’s where BMP, or best management practices, comes from,” says Collins. Erosion control is one of the components of BMP. When Collins started looking at sweepers, he chose the Tymco Comdex 600 and has been very happy with them. Now he has three, two of which were used to sweep the track at Circuit of the Americas in Austin, TX for the Formula 1 race. Collins’ drivers used the nylon brooms typical for airports and race tracks to sweep in a tandem pattern around the track. 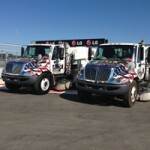 The regenerative air sweepers also got an American-themed wrap for the event. Months before the event, they swept the track multiple times. “You probably have the most laps,” jokes Chuck Aksland, vice president of motorsport operations for Circuit of the Americas. “We’ve done mostly clean up work leading up to the race,” says Collins. “Then when they were striping, we swept.” On the Wednesday leading up to the race, BMP worked at the track from noon until 6; then from 7 am to 6 pm Thursday through Sunday. They swept each morning, in between practices and qualifying races and each evening Friday and Saturday. On Sunday, they swept before, after and in between races. BMP Specialists and it’s 35 employees build and repair guard rails and pavers, build water quality ponds, plant revegetation, spray hydromulch, and sweep.